Download a printer friendly PDF of this guide here. This guide is not a substitute for airport-specific legal advice and is not intended to provide legal counsel on matters unique to any particular airport situation. Nevertheless, it should serve as a foundation to inform internal discussions and to prepare for more detailed conversations with potential private sector partners. Note that at the end of the guide is a list of resource materials that may be instructive when preparing for such discussions and conversations. A P3, in the broadest sense, is nothing more than a contractual relationship between a public entity (an airport sponsor or proprietor in this context) and a private sector entity or entities that allocates responsibility for delivery of services, investment of capital, and assumption of risk. The underlying principle of any P3 in the transportation realm is that by leveraging the respective skills and assets of the public and private entities, it should be possible to improve the efficiency by which transportation functions are provided. While any contractual relationship between a public and private entity could be called a P3, in the airport context, it has usually come to refer to the arrangement by which services or investments that traditionally have been provided by an airport sponsor are instead provided by a private sector entity. Over the past several years, U.S. P3 structures have evolved in the airport environment. They have begun to find a balance between adhering to the core interests of the public entity and engaging productively with the private sector. Airport P3s are more often targeted to specific development projects where significant capital is needed or risk is to be allocated – such as the various terminal projects at JFK and LaGuardia, the Great Hall project at Denver, or the newly privatized terminal at Paine Field in suburban Seattle. While a P3 can be very helpful in certain circumstances, it is neither a panacea nor a source of free money. P3s can also create certain liabilities for the public entity that need to be addressed. Being thoughtful in understanding the public sponsor’s goals for any project and the reasons why it might want to consider a P3 structure is a vital element in the success of any project. Addressing life-cycle cost issues – can package design/construction with operations/maintenance responsibilities to optimize the delivery of both. Notwithstanding these benefits (not all of which, of course, are available for every P3 arrangement), there are risks to the public entity in any P3 arrangement. Therefore, it is particularly important early in project planning to define the reasons why (and what kind of) a P3 path is being considered. P3 projects pursued without either clear goals or a clear understanding of the technique, can be problematic, and result in performance below expected standards. A public entity’s own internal capabilities are essential for making a P3 approach successful. While many agencies focus on the initial P3 procurement it is equally important to be attentive to internal capacity. Long-term success is absolutely dependent upon the public agency’s ability to provide robust ongoing contract administration (during the construction period), and oversight of operation and maintenance over the entire contract period. Contract management expertise and discipline are crucial beginning with the initial pursuit of a P3, because a successful procurement is built upon an understanding of (and preparation for) future project management challenges. Therefore, a public entity must understand that a P3 approach will not eliminate internal administrative costs (though they may be different or lower). The likelihood of success could seriously be undermined if the public entity fails to ensure that that internal capacity is available – from the beginning of the project. Different approaches to private airport investment in the United States illustrate the variability in the amount of the private investment and degree of governmental control. 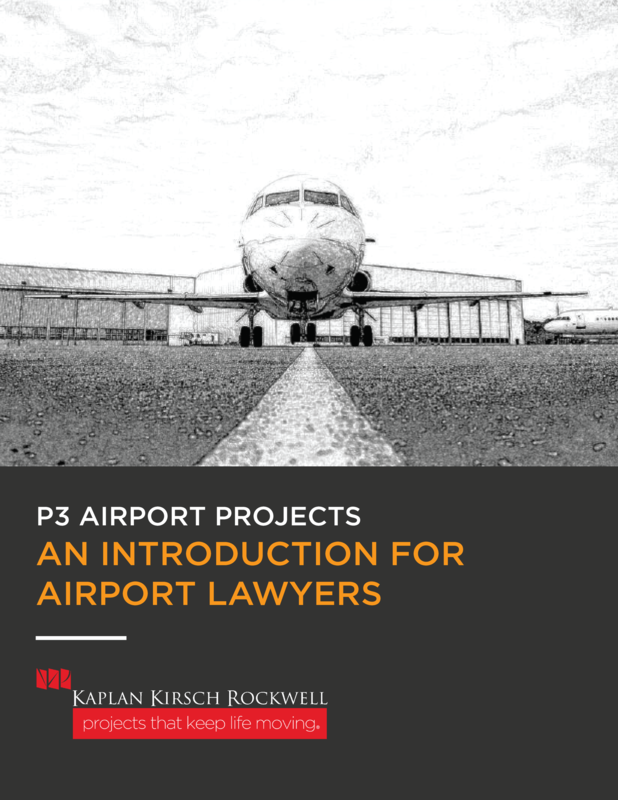 It is therefore useful to distinguish between P3 arrangements that are primarily designed to provide services or management for airport operations and those that are designed to deliver, operate and maintain a capital project. This section outlines the permutations of P3 arrangements that are used for delivery of services for an airport. Service Contracts – Contracting for noncore services, such as cleaning, elevator and electric walkway maintenance, shuttle bus operations, financial consulting and engineering and design services are routine at airports in the United States. This option requires little or no private capital investment and would not typically be referred to as a P3 absent an unusually broad scope or other customizations. Management Contracts – This option provides a vehicle for private management of existing airport facilities ranging from parking facilities to an entire airport system. Like the previous option, this approach is common in the United States with many permutations in the level of management control and extent to which operations are the responsibility of the management firm. In the U.S., airport proprietors generally at least retain contractual control over key decisions such as compliance with use and lease agreements, planning, environmental policy, and debt policy and capital expenditures. This option may be appropriate once an airport is built, or may grow from a design, build and finance structure. It is not likely to meet a local government’s need for capital investment. Airline or User Consortia – Airlines and other users increasingly perceive that they can save costs and increase operational control over airport assets by offering to enter into consortia to operate key airport assets. The most common are fuel supply or delivery consortia, in which the consortium may just operate the fuel system or may construct and finance the system as well. Consortia are used for other facilities such as baggage claim, jet bridges, underwing services and other airport functions that exclusively serve one class of users (e.g., airlines). The degree of control over management, operations and capital investment can vary considerably. Full Privatization, Long-Term Lease, or Sale – Under this model, the airport proprietor enters into a long-term concession and lease, or (less often) sale of an airport. This can be accomplished either through the FAA’s Airport Pilot Privatization Program (APPP) or outside that program if the requisite legal constraints are addressed. Airports’ experience with the APPP suggests that it is not a particularly useful model for most airports. While there are three airports participating in the program today (San Juan, PR; Westchester County, NY and Hendry County, FL), a far greater number of airports have considered and rejected, or withdrawn from the program.5 By comparison, in 2016 there were 28 "majority private" (largely P3) and 79 "fully private" airports in Europe.6 In addition to being cumbersome to use, the APPP has not proven to be effective or workable in the U.S. investment marketplace. Many sponsors also find the approach untenable because it would deprive the local government of the ability to maintain control over airport assets. Private Airport Development – There has been much discussion in the trade press and in academic circles about privately-funded airports, built and operated without federal assistance (i.e., without AIP grants). Branson Airport (Missouri) is currently the only privately-owned and developed commercial passenger airport in the United States. Branson has had enormous difficulty with its financing, has defaulted several times on its indebtedness, and is not generally seen as a viable precedent. One variation on this model that has rarely been used in the United States is the private development of an airport which is then sold or leased to a public entity. Fort Worth Alliance Airport, in Texas, is the closest example in the U.S. Alliance Airport is a cargo- and general aviationonly airport. It was a P3 venture, built mainly with public funds (on privately owned land donated to the City of Ft. Worth). The motivating private sector goal was the development of the 14,000 acres on and around the airport that was owned by the developer. This approach is particularly useful for sponsors considering greenfield sites with considerable developable land either adjacent or nearby where there is sufficient demand for such development. Design-Bid-Build (DBB) – This contracting structure is perhaps the most traditional, (so much so that many in the P3 industry do not consider it to be a P3 structure). Under DBB, the public entity engages an architect and/or a design engineering firm. A hard-bid for contractors is solicited based upon the final design. The public entity retains responsibility for financing and operating/maintaining the project. Design-Build (DB) – This structure combines design and construction in one contract, usually based on 30 percent design, and imposes responsibility and liability on one entity (usually the contractor or a special purposed consortium entity). It is typical for a DB contract to be a fixed-fee arrangement. Generally, the public entity is responsible for financing, operating and maintaining the project. There is a relatively new variation on DB known as Progressive Design Build (PDB) in which the PDB team is selected much earlier in the design process. Design-Build-Finance (DBF) – Under a DBF procurement, design, construction, and financing (complete or partial) are all combined in one contract. The public entity retains responsibility for operation and maintenance. Under this model, the design builder assumes responsibility for most of the design work (usually beyond 30 percent design), construction and full or partial financing of the project. The inclusion of private financing can also result in the contribution of private equity capital to the project structure. Design-Build-Operate-Maintain (DBOM) – The DBOM model combines design and construction with long-term operation and maintenance into one contract, and all of those functions become the responsibility of the contractor. The public entity assumes the financing responsibility for the project, and retains the project revenue risk and any upside from project revenue. Design-Build-Finance-Operate-Maintain (DBFOM) – This model is perhaps the one most commonly identified with transportation P3s in the U.S. Under a DBFOM, the developer or concessionaire is responsible for designing, constructing, financing, operating and maintaining the project. The Automated People Mover and Consolidated Rental Car Facility projects now being procured by Los Angeles as part of its LAX Landside Access Modernization Program are expected to follow this model. The typical length of a DBFOM contract is the period of construction plus 30-35 years, but it is important to recognize that there is not a single approach and the DBFOM model is evolving in the airport context. Generally speaking, the public entity retains full ownership of the project, but that, too, can be subject to some permutations. Financing is repaid either by project revenues going to the developer or by availability payments7 made by the public entity to the developer at certain milestones. Because of the financing, the private investor will need to invest private equity capital as well. Basic examples include a toll road, with toll revenue going to the developer, an airport terminal with revenues going to the developer along with some guaranteed availability payments, and a transit line with only availability payments. Financing techniques often include federal programs, such as TIFIA and PABs,8 in addition to grants used to supplement or repay the private financing. Operate-Maintain / Concession and Lease – The above models address initial project delivery. In addition, there are forms of long-term operations and maintenance or concession and lease arrangements that can qualify as P3s. At the most extreme, these would extend to the entire airport (as is the case for many European airports, but is not generally possible in the United States except through the FAA’s Airport Privatization Pilot Program). However, such arrangements can be downscaled below the level of a whole airport but still cover complex and high value airport operations. The purpose of using such arrangements would be to achieve some of the benefits of a P3 with respect to the delivery of a service or the operations and maintenance of a particular facility. In essence, this P3 is itself a permutation of the traditional maintenance or capital investment models. Development Rights in Exchange for Infrastructure Investment – This tool is relatively new in the airport industry but involves an exchange with a private sector investor in which the investor builds crucial infrastructure facilities that may not themselves be revenue-producing (e.g., runways or airfield facilities) in exchange for the ability to develop vacant airport real estate and retain revenue and profits from any development on the site. This approach gives the airport sponsor access to considerable capital without having to forfeit control over the capital facility itself. At airports with considerable vacant developable land, this arrangement can produce a win-win for the sponsor: investment in new infrastructure and new commercial or industrial development can enhance the economic value of the airport in the community. Is the public agency implementing elements of a master plan? Is the project focused on a revenue generating opportunity such as a parking garage or a consolidated car rental facility? Is the sponsor considering an unsolicited proposal for a new facility or project that is optional but could enhance the attractiveness of the airport or provide an additional revenue stream (e.g., airport hotel or solar farm)? For some airport sponsors, a less formal and institutionalized process is likely to be more appropriate, but the fundamental premise should remain the same – it is critical for airport management to have a clear and robust internal process to review prospective projects in detail on a multi-disciplinary basis and for that evaluation to proceed independent of any specific proposal. Such process should typically be conducted in consultation with capable external advisors, particularly those with relevant financial, legal and technical expertise. After initial screening, an effective evaluation process considers issues such as desirability, technical feasibility and financial feasibility. There may be more formal steps which may be appropriate, such as a value-for-money (VfM) study. A VfM study would, for example, compare a public sector traditional approach to a “shadow bid” in a P3 context, and evaluate all relevant project risks in a cash flow context. In the end, any good evaluation process must leave considerable room for old-fashioned hard questions and experienced common sense knowledge. A P3 structure does not produce free money. A P3 structure can, however, allow for financial innovation and structuring that increases the value achieved when deploying inevitability limited funds. Regardless of what structure is selected, the airport proprietor must have a way to pay for, or let the P3 developer earn, its investment and a return on its capital and risk. Management fees which are paid on a fee-for-service basis, a time-and-materials, fixed-fee or any of the other traditional bases for paying purely for services rendered. Regardless of the exact payment model, any P3 that involves the investment of private equity and debt will need to have a payment structure that is credit worthy and bankable as determined by private investors and lenders. New York. In the airport context, the new $4 billion Delta Terminal D (and C) at LaGuardia is being financed and constructed by a joint venture of Goldman Sachs and Delta Airlines, with a $600 million contribution by the Port Authority of New York and New Jersey. This follows the Central Terminal B $4 billion P3 project already underway at LaGuardia, which is being undertaken by a consortium team including Vantage, Merdiam, and Skanksa. Houston. Houston Airport System’s version of a P3 was one in which Southwest Airlines funded and constructed a five-gate international terminal at Houston-Hobby. The challenge presented by the project was that Southwest needed an international terminal and accompanying facilities on a timetable that the Houston Airport System might not practically have been able to meet. Southwest assumed responsibility for construction and is being repaid from rental revenue from itself, other tenants and concessionaires. Houston pursued this approach for a number of financial as well as political reasons, the most important of which was the strong desire to keep Southwest happy and to complete the project on an aggressive schedule acceptable to Southwest. By shifting the construction burden to Southwest, Houston was able to shift any political risk for project overruns or delays to Southwest. The project was completed on time, in 2015, and at opening, Southwest was the only international carrier using the facility. Seattle. An innovative example is Paine Field, near Seattle, the home to a Boeing’s widebody manufacturing facilities. The airport sponsor of Paine Field was confronted with an unusual political conflict when two airlines indicated a desire to begin commercial passenger service at the airport for the first time. Accommodating the airlines was a political minefield, but legally the airport could not reject the request. In order to maintain an arms-length relationship with the accommodation of passenger service, the sponsor entered into a P3 agreement for the construction of a new terminal to accommodate scheduled passenger service. The approach is essentially a DBFOM approach in which the developer is assuming all of the construction and financing risks, but the developer also retains most of the operating profit (there is only a de minimis profit sharing with the airport sponsor). To package this arrangement, the airport entered into a traditional ground lease with the developer assuming both the risk and reward from new passenger service. The private sector developer is responsible for all contractual relationships with carriers and suppliers at the terminal. Non-Airport Projects. Sometimes P3 projects are driven by financing issues, such as cash flow, as was the case with the Denver transit district’s Eagle P3 rail line to Denver International Airport. RTD, the transit district, had sufficient revenue from its sales tax revenue but could not make revenue available in the time frame necessary to build the project on its schedule. RTD also did not have sufficient remaining debt capacity to issue its own debt. Other imperatives made a P3 approach attractive, including the desire to shift long-term operations and maintenance to the private sector. In that project, the concessionaire is repaid through availability payments. A different example in the highway context is the I-70 East Project in Denver, currently being undertaken by the Colorado Department of Transportation (CDOT), the Colorado High Performance Transportation Enterprise (HPTE), and the Colorado Bridge Enterprise. Even though there is sufficient state funding available to finance this $1.1 billion project internally, CDOT and HPTE decided to pursue a P3 structure in order to shift the risk of the highly complex construction project to the developer and to include long-term operations and maintenance in the financing of the project. This decision was based on a comprehensive VfM study. Payments to the developer are to be availability/milestone payments, because of limited toll revenue generated from the additional managed lanes. Liability. Even though, in most P3 projects, the public entity shifts the construction and project delivery risk, as well as long-term operations and maintenance obligations, to the private developer, there are still inherent risks for the public sector. Contingent liabilities, such as payments for termination events or compensation events, which may reflect risk allocation between the public entity and the developer. Understanding, negotiating, and being prepared to address these liabilities in a P3 agreement is critical for public entities. Appropriate project management plays a significant role in ensuring that these liabilities are properly managed. Otherwise, change-order or compensationevent mechanisms can be abused, or performance and compliance regimes can fail to have their intended effect. Identifying these contingent liabilities and planning for them will help the public entity evaluate the merits of a P3 structure. Risk Allocation. Project risk allocation is another factor often cited by public entities as a reason for pursuing a P3 structure. Risks such as construction and project delivery, environmental contamination, and compliance with FAA regulatory requirements can be transferred – but only up to a point, and only effectively where future contract administration considerations are paired with a detailed understanding of the project’s unique challenges (beyond what precedent might suggest in terms of risk allocation). Developers often resist accepting certain risks (especially environmental risks) without considerable economic compensation. A public entity needs to be rigorous in evaluating what risks it wants to allocate and why, and in assessing the economic impact of shifting risks to the developer. Such preparations can help the public entity in successfully transferring risk. For airport projects, one unique complexity is the need to maintain compliance with the grant assurances and the related FAA regulatory requirements. Not only are the grant assurances not drafted with any sensitivity to P3 imperatives but the FAA’s general unfamiliarity with many P3 approaches means that navigating these requirements requires awareness, creativity and time. Revenue Use. Under federal law, most airports must operate as a closed fiscal system, meaning that all revenue generated at the airport (or on airport-owned real estate) must be used only for the capital and operating costs of the airport. Other infrastructure P3s do not generally have this constraint which means that models applicable to roads, rail, or utility infrastructure may not necessarily be directly transferrable to the airport environment. Regulatory Comfort. The FAA is relatively unfamiliar with many P3 arrangements, even ones that are common in other arenas. Agency staff has limited expertise in navigating the regulatory hurdles for various P3 arrangements. As a result, the agency has provided relatively little guidance and direction to airport proprietors on what is, and is not, permissible in the highly regulated airport industry. While the agency continues, at Congress’ direction, officially to support its Airport Privatization Pilot Program, it has been less enthusiastic to provide broad based guidance on how to structure P3 transactions. The guidance that does exist is generally highly fact-specific to a particular airport. Grant Assurances. Airport sponsors who accept federal grant funds (which include virtually all commercial service airports and thousands of general aviation airports listed in the FAA’s National Program for Integrated Airport Systems), are subject to a complex web of obligations that attach to the receipt of grant funds. These obligations, known as grant assurances, generally carry a 20-year duration from the date of the last FAA grant. Accompanying the grant assurances is a complicated set of contractual provisions which the FAA requires be included in any airport sponsor contract with private sector entity.12 The sheer number and breadth of these contractual provisions could significantly discourage private investment unless or until the FAA provides greater clarity on the extent to which the grant assurances apply to private sector partners in a P3 arrangement. Mandatory Contract Language. FAA requires that an airport sponsor’s contracts contain both a subordination clause, (subordinating the relationship to any current or future FAA contractual or regulatory requirements) and a long list of contract clauses addressing issues such as civil rights, labor relations, and other provisions which are not necessarily common in the private sector. The FAA has yet to provide any guidance on the extent to which these requirements apply to P3 arrangement or, more generally, to private sector contractors who have no contractual privity with the FAA. Airlines and Other Users. Airlines and other airport users have historically been skeptical of P3 arrangements because of the fear that they will result in higher rates and charges, could lead to diversion of revenue from the airport and, perhaps most importantly, could reduce the political and practical control that users traditionally have over airport decision making. As more of these arrangements prove successful, this skepticism is likely to dissipate. Airport Cooperative Research Program (ACRP) Report 66: Considering and Evaluating Airport Privatization, TRANSPORTATION RESEARCH BOARD (2012), http://www.trb.org/Publications/Blurbs/167156.aspx. Successful Practices for P3s: A Review of What Works When Delivering Transportation via Public-Private Partnerships, U.S. DEPARTMENT OF TRANSPORTATION (2016), https://www.transportation.gov/sites/dot.gov/files/docs/P3_Successful_Practices_Final_BAH.PDF. Guidebook for Risk Assessment in Public Private Partnerships, U.S. DEPARTMENT OF TRANSPORTATION (2013), https://www.fhwa.dot.gov/ipd/pdfs/p3/p3_guidebook_risk_assessment_030314.pdf. Risk Assessment for Public-Private Partnerships: A Primer, U.S. DEPARTMENT OF TRANSPORTATION (2012), https://www.fhwa.dot.gov/ipd/pdfs/p3/p3_risk_assessment_primer_122612.pdf. Value for Money Assessment for Public-Private Partnerships: A Primer, U.S. DEPARTMENT OF TRANSPORTATION (2012), https://www.fhwa.dot.gov/ipd/pdfs/p3/p3_value_for_money_primer_122612.pdf. P3 Toolkit: Publications, U.S. DEPARTMENT OF TRANSPORTATION, https://www.fhwa.dot.gov/ipd/p3/toolkit/publications/ (last visited April 5, 2017). P3 Toolkit: P3-Screen, U.S. DEPARTMENT OF TRANSPORTATION, https://www.fhwa.dot.gov/ipd/p3/toolkit/p3_screen/ (last visited April 5, 2017). P3 Toolkit: Risk Valuation and Allocation for Public–Private Partnerships (P3s), U.S. DEPARTMENT OF TRANSPORTATION, https://www.fhwa.dot.gov/ipd/pdfs/p3/factsheet_02_riskvalutationandallocation.pdf (last visited April 5, 2017). Rachel Y. Tang, Airport Privatization: Issues and Options for Congress, CONGRESSIONAL RESEARCH SERVICE REPORT (2016), https://fas.org/sgp/crs/misc/R43545.pdf. Federal P3 Screen: The Guide for Federal Departments and Agencies, PPP CANADA, http://www.p3canada.ca/en/about-p3s/p3-resource-library/federal-p3-screen/ (last visited April 12, 2017). Federal Screening Matrix, PPP CANADA, http://www.p3canada.ca/en/about-p3s/p3-resource-ibrary/federal-creening-matrix/ (last visited April 12, 2017). Public Private Partnerships Reference Guide Version 2.0, INTERNATIONAL BANK FOR RECONSTRUCTION AND DEVELOPMENT (2014), http://documents.worldbank.org/curated/en/600511468336720455/pdf/903840PPP0Refe0Box385311B000PUBLIC0.pdf. PPP Cycle, PPP KNOWLEDGE LAB, https://pppknowledgelab.org/ppp-cycle (follow ‘read more’ hyperlink under Basics, Framework, Design & Bid, and Implementation). Final 2016 Virginia P3 Project Pipeline, VIRGINIA PUBLIC-PRIVATE PARTNERSHIPS (Jan. 4, 2016), http://www.p3virginia.org/wpcontent/uploads/2016/02/Final-January-2016-P3-Project-Pipeline.pdf. VIRGINIA PUBLIC-PRIVATE PARTNERSHIPS, http://www.p3virginia.org/ (last visited April 12, 2017). Draft Implementation Manual and Guidelines for the Public Private Transportation Act of 1995, VIRGINIA PUBLIC-PRIVATE PARTNERSHIPS (Jan. 2016), http://www.p3virginia.org/wpcontent/uploads/2016/01/PPTAImplementation-Manual-01-04-2016-final-posted-to-website-before-Jan-CTB.pdf. 1 The World Bank notes, “[t]here is no standard, internationally-accepted definition” for P3 (also known as PPP) and, as a result, “[t]he term is used to describe a wide range of types of agreements between public and private sector entities”. See What Are Public-Private Partnerships?, PPPIRC World Bank Group, http://ppp.worldbank.org/public-privatepartnership/ (last visited April 12, 2017). For purposes of this paper, we use the term P3 to refer to “contractual agreements formed between a public agency and a private sector entity that allow for greater private sector participation in the delivery and financing of transportation projects”, as such definition emphasizes that such arrangements can come in different forms and are distinguished primarily because they differ relative (i.e. “greater” participation) to customary existing practice. This approach is appropriate in the U.S. airport context given an existing baseline of private sector involvement in airport infrastructure delivery and management. See Innovative Finance Support: P3 Defined, DEPARTMENT OF TRANSPORTATION FEDERAL HIGHWAY ADMINISTRATION, https://www.fhwa.dot.gov/ipd/p3/defined/ (last visited April 12, 2017). 2 See infra note 5. 4 The U.S. Department of Transportation’s publication “Successful Practices for P3s,” (March 2016), is a good reference document. It is important to recognize that, if an airport proprietor intends to seek AIP funding for a project, not all project delivery mechanisms are available and many that may satisfy federal requirements are not familiar to federal contracting officers. It may be necessary to educate local FAA officials if the airport were to pursue any of these alternatives. See Successful Practices for P3s: A Review of What Works When Delivering Transportation via Public-Private Partnerships, U.S. DEPARTMENT OF TRANSPORTATION (2016), https://www.transportation.gov/sites/dot.gov/files/docs/P3_Successful_Practices_Final_BAH.PDF. 5 The Airport Privatization Pilot Program was established by federal law in 1966. 49 U.S.C. § 47134 (2012). According to the FAA, the program is “designed to allow airports to generate access to sources of private capital for airport improvement and development.” See Fact Sheet – What is the Airport Privatization Pilot Program, FEDERAL AVIATION ADMINISTRATION (Sept. 27, 2013), http://www.faa.gov/news/fact_sheets/news_story.cfm?newsId=14174. Federal law limits the number of participating airports to 10, of which only one can be a large hub airport and at least one must be a general aviation airport. There are currently only three airports participating in the program: (1) a small general aviation airport in Hendry County, Florida; (3) Westchester County Airport, and (3) San Juan, Puerto Rico’s Luís Muñoz Marín International Airport. Eight other airports have considered or started participation in the program but have later dropped out. The principal advantage of participation in the program is that federal law waives certain prohibitions on revenue diversion as a mechanism to encourage private investment. Nevertheless, the rigidity of the program and of the procedural requirements has made the APPP unattractive to most airport proprietors and to investors. 6 See The Ownership of Europe’s Airports, AIRPORTS COUNCIL INTERNATIONAL (2016), http://newairportinsider.com/wpcontent/uploads/2016/04/ACIEUROPEReportTheOwnershipofEuropesAirports2016.pdf. 7 Availability payments generally are contractually guaranteed payments the public entity makes to the private entity to pay for construction, cost of capital, and operation and maintenance, and usually involves projects with little revenue generation. By contrast, for a revenue generation project, there are usually no availability payments and the private entity receives all or part of the upside profit from the project itself, such as a parking structure or terminal facility. 8 U.S. DOT’s Build America Bureau (BAB) administers both the Transportation Infrastructure Finance and Innovation Act (TIFIA) loans as well as the Private Activity Bond (PAB) program. See About the Build America Bureau, U.S. DEPARTMENT OF TRANSPORTATION, https://www.transportation.gov/buildamerica/about (last visited April 12, 2017). 9 See, e.g., Final 2016 Virginia P3 Project Pipeline, VIRGINIA PUBLIC-PRIVATE PARTNERSHIPS (Jan. 4, 2016), http://www.p3virginia.org/wpcontent/uploads/2016/02/Final-January-2016-P3-Project-Pipeline.pdf; VIRGINIA PUBLIC-PRIVATE PARTNERSHIPS, http://www.p3virginia.org/ (last visited April 12, 2017); Draft Implementation Manual and Guidelines for the Public Private Transportation Act of 1995, VIRGINIA PUBLIC-PRIVATE PARTNERSHIPS (Jan. 2016), http://www.p3virginia.org/wpcontent/uploads/2016/01/PPTAImplementation-Manual-01-04-2016-finalposted-to-website-before-Jan-CTB.pdf. 10 See Providing for Public Private Transportation Partnerships Implementation Manual & Guidelines, THE COMMONWEALTH OF PENNSYLVANIA 16 (Sept. 29, 2014), https://www.dot.state.pa.us/public/Bureaus/press/P3/P3ImplementationManual&Guidelines.pdf. 11 See supra note 4, at 33. 12 In early 2016, the FAA published a comprehensive list of required contract language. See Required Contract Provisions for Airport Improvement Program and for Obligated Sponsors, FAA AIRPORTS (Jan. 29, 2016), https://www.faa.gov/airports/aip/procurement/federal_contract_provisions/media/combinedfederal-contract-provisions.pdf. While this comprehensive list, has been useful, it has also left open a number of complex questions concerning the circumstances under which language must be included in contracts with no federal financial involvement or where the airport proprietor has no direct contractual privity. Id.